Thanks to Organized Kidmin for this article by guest writer Corinne Noble. I am extremely passionate about kids experiencing God through worship. I was honored to share on this topic in two of my breakouts at the CMConnect Conference this year. Perhaps you are struggling with getting the majority of the kids in your ministry to engage in worship. You are definitely not alone. This is a big struggle for many kid’s ministries, but I believe it is possible to engage kids in worship. It’s worth the extra effort and time to help kids have an authentic worship experience. Maybe this scenario will sound familiar to you: The worship team enters the stage and says it’s time for worship! The kids stand up and begin to worship. As you look around the room, you see your leaders standing in the back of the room, behind the children, disengaged, talking to other leaders, and possibly even on their phones. If this is happening in your ministry, it is hurting your chances of engaging the kids in worship. 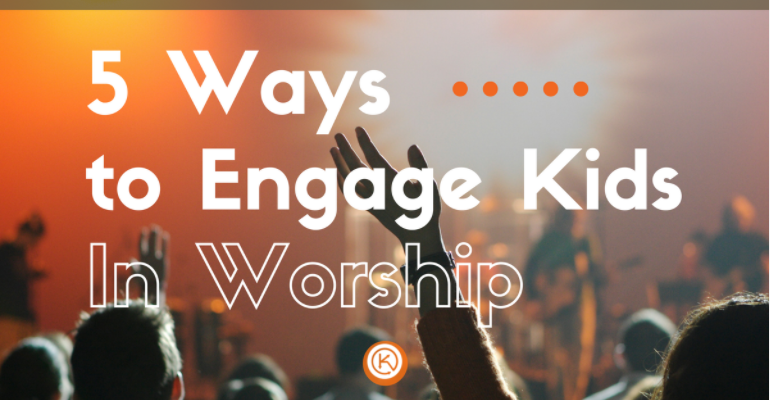 I am excited to share with you five effective ways to engage the kids in your ministry in worship. Every leader who is in the room should be participating in worship with the kids, not just the worship leaders on the stage. I encourage my leaders to spread out and stand among the kids while they are worshipping. Remember, you can’t lead from behind. Kids need to see their leaders engaging in worship, but they can’t follow their example if they are standing in the back of the room. The leaders in the room need to set the energy level for the worship service, not the kids. If the song is upbeat and/or has motions, they should be jumping around or doing the motions. If it is a slow worship song, they should be worshipping by example (raising their hands, singing, etc.) like they would in the adult service. Seek out worship team members who are male and female. Use older kids, teenagers, and adults if possible. The more variety you have on the stage the better. If you don’t have as diverse a team right at the start, don’t be discouraged! Teams aren’t built overnight. When the kids see a diverse group of leaders worshipping on the stage, it will help convey the idea that worship is for everyone. Teenage and adult males are the hardest to recruit for this position, but they are the most valuable. I have heard many kid’s pastors complain that the oldest boys in the room won’t participate in worship. Having male leaders on the stage leading worship is key in engaging older boys in worship. Encourage your leaders to expect God to move in their lives, not just the kids’ lives. There is no age limit on God’s presence. Don’t go into a worship service with a lower expectation just because it’s for kids. Sometimes kids can have a much easier time entering into the presence of God and having an encounter with Him much easier than adults because they are much less self-conscious about their surroundings. Most people don’t like to hear themselves sing, so it’s important that the volume of the music is loud enough that your kids (and leaders) have the impression that no one can hear them singing. This helps remove the barrier of self-consciousness which can prevent them from fully entering into the presence of God. Make sure your room (other than the stage) is relatively dark, so kids are focused on the stage (whoever is leading worship) and are not distracted by other kids or elements that might be present. During fast worship, moving lights and/or changing colors can help get kids excited and encourage them to jump around and be energetic (think concert-like). Haze (or fog) can be an excellent addition to your service to help get kids excited about the fast songs. In contrast, during slow worship, cooler colors (blues/purples) that aren’t changing quickly and slower movement on your moving lights can help kids focus. We’ve started using worship intro videos to help kids get in the mindset of worship. The worship intro video plays while the worship team is entering the stage, and helps in avoiding that awkward transition into worship. We also keep track of the motion backgrounds that are used behind the lyrics on the screens to keep them in the same color palate as the lights and to make sure their movement is appropriate for the song. When you bring the kids out of their seats and invite them to the front of the room, it removes them from the distractions at their seats and gives them room to spread out. When you first implement this in your ministry, you might find that some of the kids are stubborn about coming up to the front. If you have all of your leaders come behind the kids and encourage them to come to the front for a few weeks, they will all just start to come to the front naturally. We are going to spend some time worshipping God today. Worship is expressing on the outside how much we love God on the inside. Some of the ways we can worship God are by singing, jumping, dancing, clapping, raising our hands, or kneeling. We worship God to show him we are thankful for what He has done fo us. Let’s raise our hands and give everything to God today. Close your eyes and focus on the words of this song. We are here to spend time with God. One of the ways we can do that is by worshipping Him. Don’t worry about what anyone else is doing, close your eyes, and focus on worshipping God. First, I want to clarify that worship isn’t only about singing and music, but it is one of the main ways we worship God during our kid’s services. Your music choices will often dictate how effective your worship service is. If you want to engage the older kids in the room, use music they might hear on the radio, in youth group, or in the adult service. You don’t have to use all the same worship songs as the youth ministry or main service, but it helps to create a similar worship experience throughout the church when everyone is using some of the same music. Ideally we want to prepare our kids for a life of worship. If kids are only trained to engage when they hear “kids worship music”, they will have a harder time engaging in other venues (youth group, main service, etc.) where a different style of music might be used. Some of the worship songs that are used in the adult service may not be a good fit for kid’s worship. Try to avoid songs with too much imagery. If kids can’t understand what they are singing, how can they authentically engage in worship? Kids (and adults for that matter) won’t engage in songs they don’t know, as well as they will with familiar songs. When you introduce a new song, pair it with older songs the kids will be familiar with. Repeat the new song a lot in the first month so the kids begin to learn it. We use the same slower worship song every service for the entire month because we believe the kids begin to engage more when they know the words to the song. We use a mixture of Hillsong Young and Free, Planetshakers, Elevation, Free Chapel, Hillsong, Bethel and many others. I am not saying these are the only good artists, but some of their songs have been effective and well-received by our kids. The music you choose to use during worship may be different based on the demographics of your area, the type of church you serve in, and what the Worship Pastor uses in the main service. We can’t assume kids understand worship. We need to teach them about worship. Why do we worship God? How can we worship God? Where can we worship God? When can we worship God? When we answer these questions we are opening up the door for kids to authentically enter into worship. Worship is anything we do to show God we love him. Encourage the kids to worship God throughout the week in everything they do. Worship can be expressed through singing, praying, giving, serving, obeying, art, using our talents, sharing Jesus with our friends, etc. One of the ways we provide opportunities for kids to have extended worship times, is through Kid’s Worship Nights, which are events geared toward specifically worship. We teach on worship, have extended worship/altar time, break into small groups for discussion, and put worship into action through small group activities. If you are interested in learning more about how and why we do Kid’s Worship Nights check out my post: Kid’s Worship Nights: Behind the Scenes. This may not be an option for all churches, but it is definitely a bonus in engaging kids in worship. Think about it, does the youth ministry at your church have a live worship band? Does the main service have a live worship band? If you answered yes to one or both of those questions, why doesn’t kid’s ministry have a live worship band? Have you asked anyone? There may be teens and adults in your church willing to be a part of a live kids worship team if you just put the opportunity on the table. There may be people who love leading worship/just started playing an instrument who may not have made it on the adult worship team. They might be able to come grow in their ability to lead in kid’s ministry. Talk to your youth/worship pastors about teenagers on the youth worship team and people who are already on the adult worship team being on the kid’s worship team. We use a lot of people who are already serving on the youth or adult worship teams on our kid’s team. We strategically place our worship in kid’s ministry after the worship is finished in the main service to allow people to be able to serve on both teams. We allow our select 6th graders to sing on the kid’s worship team. It’s a great place for them to get started. What does the adult worship team do when they need more people? They hold worship team auditions. We can hold kid’s worship team auditions as well. Get the word out via email, facebook, announcements, personal invitations. We got our initial kid’s worship team from holding one audition. Over the next few months, other people heard about it and we grew to having two full teams that rotate. The worst that can happen is no one will show up, so it never hurts to try. Having a live worship team helps provide a smooth transition from kid’s ministry to youth and adult services if those ministries have a live worship team. Creating bridges between our ministries will help kids and youth stay connected to the church.